You can adjust either edge of the demodulator's bandwidth by pointing at the left or right edge of the demodulator bar until you see a cursor appear that looks like a tilted, double-headed arrow, then clicking and dragging with either mouse button, or using the mouse roller while you hold the mouse button down. You can also adjust the demodulator bandwidth by →Left-click KLK, then using the ^ ↑, ^ ↓, ^ → and ^ ← keys on the keyboard. You can remap these function with Ref. →Right-click BW4 will set the BW2 through BW6 bandwidth memories to values evenly spaced between BW1 and BW7. If -Ri is on when you do this, then all bandwidth memories will set -Ri; if it is not on at the time you →Right-click BW4, then all bandwidth memories will set -Ri instead. A memory set to 100:2800 is 2700 Hz bandwidth. So if the demodulator is set to 100:2800, which exactly matches the setting, then BWx. The same memory will be BWx if the demodulator is set to 150:2850 because this is still 2700 Hz bandwidth, but the bandwidth is shifted up, that is, starts and ends at higher points. 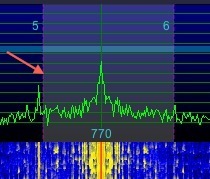 The same memory will be BWx if the demodulator is set to 50:2750 because this is still 2700 Hz bandwidth, but the bandwidth is shifted down, that is, starts and ends at lower points. Note: In some versions of OS X, some of the keystrokes you may want to use have been "taken over" by the operating system. 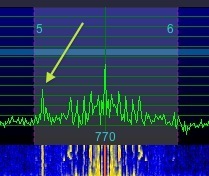 If you wish to use them with SdrDx instead of for the purposes OS X has assigned them, open the OS X preferences (the control panel application) and disable the operating system's use of the keystrokes and the SdrDx application will then be able to see them. With AM and FM , the left and right edges adjust together, or symmetrically. With USB, LSB, FSU, FSL, CW , and SAM, the left and right edges adjust independently. Independent demodulator edge controls are the equivalent of independent left and right IF shift controls with automatic passband compensation on an analog radio. However, you can also perform an actual IF shift (without passband compensation) in USB, LSB, FSU, FSL, CWU and CWL modes.